The selection criteria was based on the concept, implementation and presentation of the project. The winning entry titled “TdxCopter” was submitted by Patrick Knüppel and Beni Winter, Switzerland. 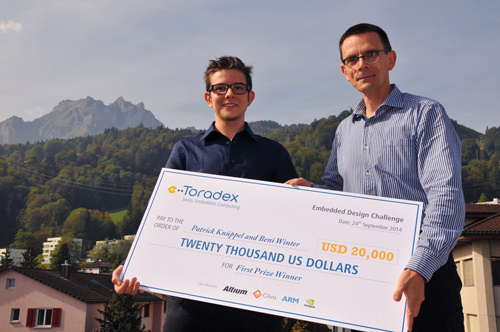 The winners were presented with certificates, and cash award of USD 20,000 by Mr. Stephan Dubach, Toradex AG CEO. On the occasion, Mr. Dubach said, “Toradex Challenge was envisioned to provide a platform for students to innovate and build their ideas into working products. We have received notable and inspiring projects from around the globe. The TdxCopter team's commitment and passion is truly commendable and we are indeed proud of their achievement”. The Embedded Design Challenge is a global initiative aimed at students and design enthusiasts. Participants register their ideas and the approved projects get a Toradex development kit. The projects are evaluated by a panel of judges and the winners are selected bi-annually (twice a year). The first prize winner is awarded prize money of $20,000, the second prize winner gets $10,000 and there are four consolation prizes each of $5,000. Toradex Design Challenge was made possible by support from our partners and sponsors that are committed to helping the students embrace the full potential of technology. These partners include NVIDIA®, Altium®, Ciiva and ARM®.